A Vector Space Systems rocket at Launch Complex 46 of the Cape Canaveral Air Force Station in Florida. 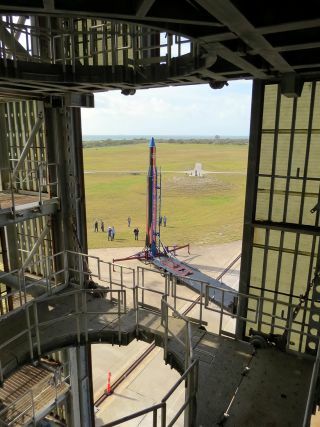 CAPE CANAVERAL, Fla. — Eyeing a projected boom in demand for microsatellites, startup Vector Space Systems on Saturday (March 25) unveiled plans to fly its small launch vehicle from a Florida-owned launch pad at Cape Canaveral Air Force Station. "We need precisely what that one has," Vector co-founder and chief executive Jim Cantrell told Space.com. Orbital ATK has a mission booked at LC 46 for later this year for its Minotaur IV rocket. In 1998 and 1999, Lockheed Martin flew two Athena boosters from the pad. The U.S. Navy originally used the pad in the 1980s to test Trident II missiles. With its mobile launcher system, Vector Space aims to use LC 46 beginning in 2018 for its small-satellite rockets, known as Vector-R (Rapide) and Vector-H (Heavy). The 45-foot-tall (14 meters), two-stage Vector-R is designed to carry payloads of up to about 140 lbs. (64 kilograms) into low-Earth orbit at a cost of about $1.5 million. That's less than half the price of Rocket Lab's larger Electron rocket, which is being prepared for its debut test flight from New Zealand in the next few weeks. An optional third-stage electric motor on a Vector-R can deliver a satellite up to 500 miles (800 kilometers) above Earth for an additional $500,000. The larger Vector-H version sells for about $3 million. The rockets are simple, with no pumps and far fewer components than current boosters have. The Vector's first stage, for example, has just 15 parts, Cantrell said. For propellants, the rockets use propylene and liquid oxygen. The propylene is compressed to a liquid and chilled to make it about as dense as kerosene. "You have a small rocket with a lot more energy," Cantrell said, adding that the burning propylene creates a distinctive, bright-orange flame. Suborbital test flights are scheduled to begin next month from the Friends of Amateur Rocketry's (FAR) launch site near California's Mojave Desert. So far, Vector Space, based in Tucson, Arizona, has contracts for 105 flights. Customers include Finland’s Iceye, which is developing a satellite constellation to provide near-real-time global radar imagery; Denver-based small-satellite manufacturer York Space Systems; and Bethesda, Maryland-based PlanetiQ, which is developing a commercial weather-satellite network. Vector Space also has an agreement to fly from Alaska’s Kodiak Island and other locations, including outside the United States. The company has raised about $4 million in seed funds and won DARPA and NASA contracts for about another $4.5 million. It is in the process of a Series A investment round, with the aim of raising $15 million, Cantrell said. Vector Space, founded and run by veterans from SpaceX, Virgin Galactic and other aerospace companies, has an ultimate goal of opening space access to anyone — no satellite required. Instead of buying and operating satellites, the company envisions customers using software applications to get what they want via a cloud of satellites. The project is known as Galactic Sky. "To me, this is the PC of space," Cantrell said. "It is going to upend the industry in a way people just don't understand."